The practice may seem jarring to modern sensibilities, but a century and-a-half ago, reusing the name of a dead child for one born at a later time was relatively common. Of course, child mortality was also more common, which no doubt was a factor in the less-sentimental attitudes of that day. In my own family line, my great-great grandfather, William Aylard, fathered two sons named William by his second wife, Fanny (Levet). 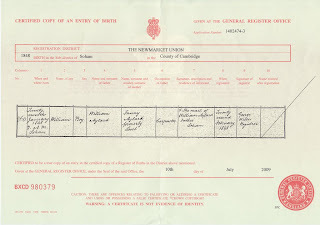 I provided some brief detail about the first-born William in my last post. That son was born in 1845 and died less than a year later, in 1846. A year and-a-half after this tragic death, in January 1848, a second son was born to William and Fanny, and he was also named William. 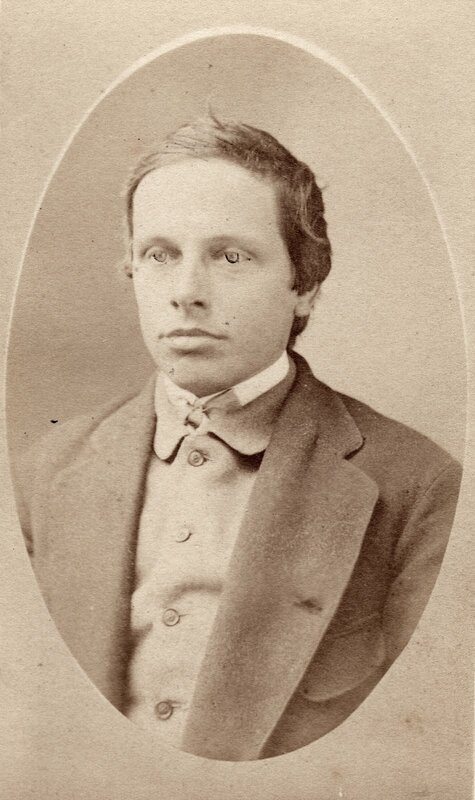 The second William, often named Will in adulthood, emigrated from England to the United States with his father and sister, Sarah, around 1851. 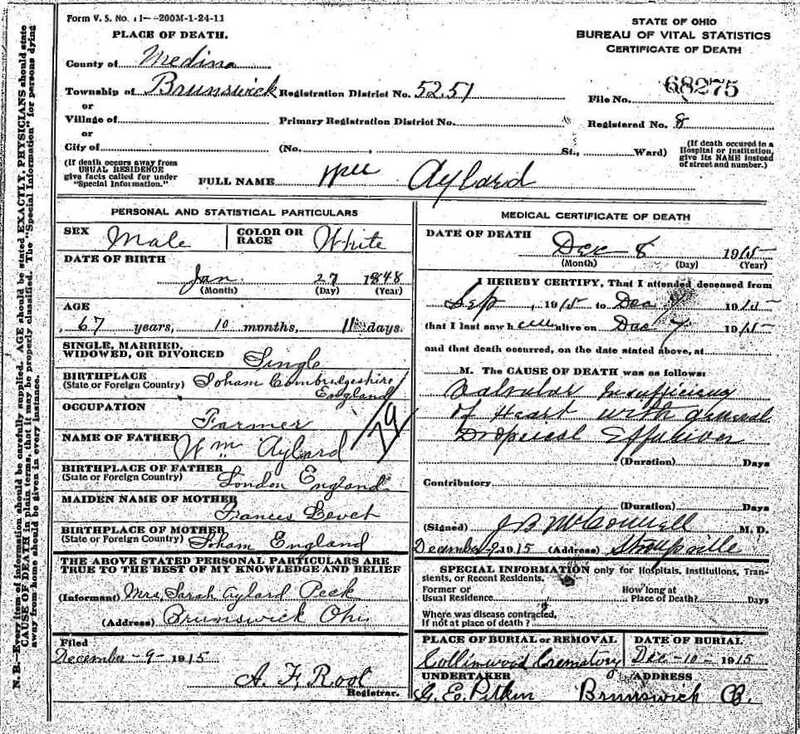 After several years living in New York state, Will moved with his father, step-mother, sister and growing family of half-brothers and half-sisters to Ohio where he lived the remainder of his life, until his death in 1915 of a heart condition. He is not known to have ever married or fathered any children. 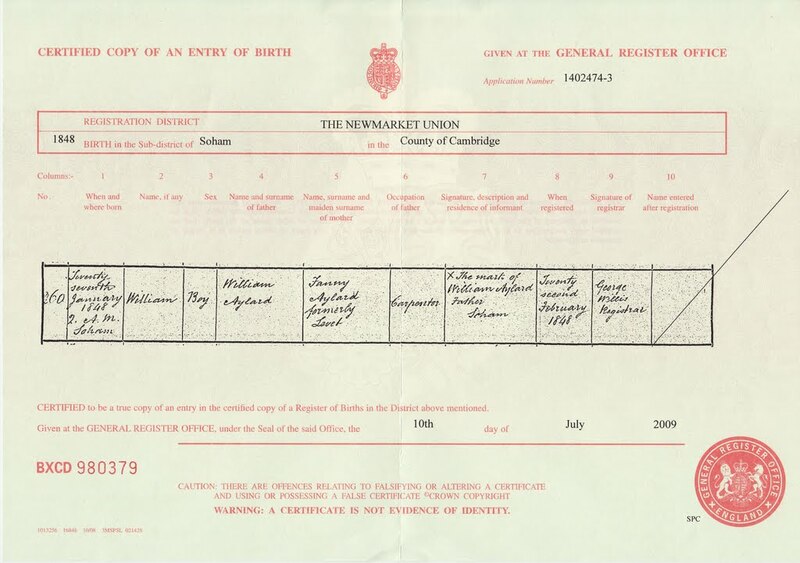 England, birth certificate (short form) for William Aylard, born 27 January 1848; citing 14/26/260, Newmarket Union registration district; General Registry Office, Southport. 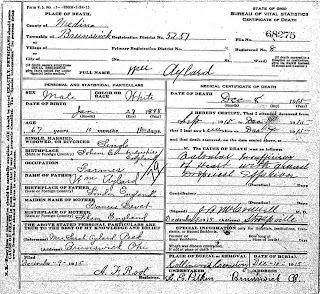 State of Ohio, Bureau of Vital Statistics, “Ohio Deaths, 1908-1953,” database, FamilySearch.org (https://www.familysearch.org : accessed 28 December 2008), Certificate of Death for William Aylard, File No. 68275 (1915). "Back to the Homeplace" and "The Homeplace Revisited"
Our German ancestors did that often. It through me off when I first started researching, but I quickly learned that was the norm. I really like your "how I'm related" graphic. Great idea! The Bones & Branches title consists of the font IM Fell Great Primer Pro by Igino Marini, based on a hand-cut font originally created by Peter de Walpergen in 1684 (http://iginomarini.com/fell/the-revival-fonts/); and the Jane Austen font by Pia Frauss (http://www.pia-frauss.de/fonts/ja.htm). © 2011 James A. Aylard. Theme images by konradlew. Powered by Blogger.